At the behest of a good friend, who asked me on Facebook what I thought of the following article on the Web, I read the article. I tried to read it twice, to assist in getting past a significant number of potholes and bumps in the text, but I simply could not muster the initiative to get past that first reading, which left my friend feeling with regard to Mr. Kay’s narrative, “he goes over my head a few times.” I felt, conversely, that my friend was being charmingly polite and self-effacing. As you will see, I can’t manage these otherwise authentic sentiments and remain credible in what would be in me my feigned sincerity. Here is the link to the “Fast Company” Web page with the article in question. You can read it before or after reading what I have to say. Or, if you have sufficient self-regard, you can skip it altogether. If you have an overabundance of self-regard, it’s possible you’ll elect to stop reading me right here. Undoubtedly Alan Kay has always been a smart cookie. It’s not entirely clear that he is able to articulate intelligibly and clearly what goes on in that head of his, not from this Fast Company interview. It’s been filtered through the mindset of a typical Fast Company contributor, which is to say, one of a huge team of well-educated millennial ax-grinders. Whatever Kay actually said remains, likely irretrievable, in the silicon pathways of Brian Merchant’s digital recording device. That’s the first problem with extracting anything of meaning, never mind of value, from this deliberate, cozy, but still reverential brush with the greatness of late 20th century cybernetic science pioneers. The second problem is that, despite the first fact, I think, but cannot be sure, it’s possible to extract some hints of motive in the various expostulations of Mr. Kay, though these may have been colored by the mission of young Mr. Merchant (as evidenced in his selective contributions to the “conversation” documented here). It sounds like there’s more than a bit of the product designer manqué in Kay, and despite his generous assessment of Steve Jobs’s marketing genius, it seems clear that the deficiencies he delineates in the progress of the product concepts he envisioned with his collaborators more than 50 years ago now are more of a marketing nature, than of a failure in the evolution of the underlying technology, which he hardly touches on (possibly because the lede here should have been not that Mr. Kay is not impressed—this seems to be a fragmentary memoir of his history of insufficient esteem for the accomplishments of Mr. Jobs, with whom Mr. Kay seems to imply a collaborative bond—but that Mr. Kay would have loved to have introduced products to a market that had the same demonstrable, indeed monstrous, success as those that Apple actually did present so successfully, going back to the iMac). Further, and this is the third and possibly the biggest of the problems I have reading this feature story from “Fast Company,” it is not at all clear that errors in navigation, so to speak, for the great ship of Human Knowledge (with its fleet of support vessels, which entail the means of not merely furthering its course, but how it will continue to sail the endless seas of the universe), at least since the advent of products that further what I’ll call the market for consumer computing, are attributable to the products being offered so much as the applications to which the market asserts its preferences. In short, it’s never been my perception that Apple envisioned the design and production engineering of a product that would optimally enable spending hours playing the wholly hermetic self-involvement of a game called “Candy Crush.” Along these lines, and more in an abstract sphere, Kay had occasion to allude to the great, if not culturally cataclysmic, aperçu of Professor Marshall McLuhan concerning the impact of certain specific mechanical technologies on not only human societies, but on human nature. I think it’s unfortunate that Kay, I am sure unwittingly and unintentionally (but who knows?) perpetuates the perception that McLuhan was a philosopher (and maybe possibly an evolutionary psychologist) when he was, in fact, mainly a literary qua cultural critic. Today, he spends most of his time investigating the myriad ways humanity is attempting to survive itself. Talking of high-minded purposeful solipsism. Instead of McLuhan, it seems as if Kay, and his self-appointed henchman Merchant, should have dug a bit more into the ideas of Teilhard de Chardin, and in particular that of the noösphere. It’s a concept that has been kicking around (though it’s hardly a popular lively topic) since the 1930s, and thereby lends a certain estimable patina to the already comfortably burnished ideas that issued from the labs of not only Xerox (the company that never got over not becoming what Apple has proven itself to be, though it showed every promise of doing so; it just could never get over the hump of being utterly incapable of conceptualizing and developing products that could be marketed and sold successfully to the mass consumer market… something that Sony, Apple, and for a long while (until it lost its technological grip) Polaroid, among many others, had proven themselves to be), but of a great number of academic laboratories and whole departments in the applied and theoretical sciences. The notion that there is a concurrent, coextensive, and (insofar as I can understand some complex and possibly arcane theory) commingled developmental human capacity keeping pace with, if not finally and now (should I say NOW!) exceeding the excrescences of evolution, usually understood in terms of natural selection is, in short, not a new idea. That there is a superceding (what I will provocatively call) ontological development in the evolution of human epistemology—please IM me if that “human” is redundant, and I’m just sounding like a fool—remains to be proven, however. But a lot of people seem to sure want to think so. And a lot of very smart people are counting on the insinuation of certain largely 20th century technologies (starting with the Turing engine—in the form of the still barely modern digital computer—and continuing through the accretive accumulation of a wide range of programming languages, including so-called object-oriented ones, but not stopping with them, as well as mimetic architectures for computer engine design (with their tightly bound software|hardware manifestations) with neural networks the most prominent as an example in my mind) in the gestation of some new kind of what I’ll call consciousness, and which Kay here, very clumsily and slightly incoherently calls “another level of thought.” There is, possibly, some suggestion, and this would be particularly in keeping with the thinking of the theorists of noöspheric structure, that this presumably extranumerary level of thought is, in fact, a wholly new level of thought—somehow, again mysteriously and incomprehensibly (here) aided and abetted, if not stimulated, with some vague suggestion of insemination, by the great potential computing advances envisioned in Palo Alto, and other places. That, the aiding, abetting, the, uh, stimulation, the, erm, insemination, which is to say, the enabling of some new dawn of thinking would occur if only we would let it. Except we are bent on watching serially, or with sporadic binging, entire seasons of the alleged comedy series “Bojack Horseman.” All that potential enlightenment down the omniverous black hole of popular culture. Having said all that, allow me to say, just briefly, because I am afraid that I have already taken up too much of your time to leave you comfortable, even at the risk of seeming suddenly to change the subject. I’m not. I’m just doing what every creative nonfiction writer in this day and age does, worth his or her rhetorical salt, and that is, I am making it personal, because the mission of deconstructing and then deriding the suspect emissions of a noteworthy brilliant computer scientist is always a dead end. Unlike Mr. Merchant, who by familiar conversational postures and ploys suggests he is, I am not by any means Mr. Kay’s peer (though, to play the age card, I am far closer chronologically than Mr. Merchant can ever be while Mr. Kay lives—and thereby have my own memories of the very same periods of the development of computer products and the underlying science and engineering). Nevertheless, I have no problem stating that I am not at all unimpressed by Apple’s latest product announcements, and especially in the light of what small lights went off in my mind (kind of premonitory LEDs) as I watched the Apple Event on September 12, the extended product commercial, wherein they announced the much anticipated new line of iPhones. First let me say, and I must offer the caveat that I am not an inveterate watcher of these fanboy events—I’ve never watched one from beginning to end, as I did this one, before. Something told me, and I can’t say what (nor do I wish to devote the time and emotional energy to figuring out what “told” me; I’ll just say, I have a lot of faith in intuition), to watch. After consciously noting and filtering out that tsunami of ejaculations (I am speaking entirely of rhetorical phenomena) from the mouths of the parade of Apple executives delegated to announce the products and their attendant features, consisting essentially of the words, “beautiful” and “magic,” I realized that two things struck me as particularly compelling. I don’t pretend to be an exhaustive reviewer of popular media, or even the self-consciously nominal intellectual fare of which I am a significant consumer. But little attention was paid to two facts about the new products, one a functional capability of the newly announced Apple Watch Series 3 and the other a facet of the underlying enabling computer design of the new crown jewel of smartphones, the iPhone X. Second, and this could be even bigger, but I can’t say, because I don’t have the bona fides for even thinking about potential applications, the new iPhone X, embedded in the Face ID engine of the product, has a computing advance—with clear, proven, highly affordable manifestations, albeit as a consumer product the vendor is hard-pressed to describe to an avid public in any language other than to use the ridiculous word, “magic.” It’s not magic, but it is incredibly powerful, and it will fit in anyone’s pocket. I am speaking of the architecture of the new A11 Bionic Neural Network chip in the iPhone X. This was conceivable, but, if you will, unthinkable in a consumer product, back in the 1980s (for perspective, the Macintosh, which Mr. Kay considered the first personal computer “worth criticizing,” was introduced in 1984; it was capable of facilitating, but in what in hindsight was only in the most primitive way, the graphic user interface, with the ability to “draw” on the screen of a cathode-ray tube… and, frankly, not much else worth noting, except the use of a new “input” device charmingly called a mouse, and all of which were envisioned by Mr. Kay and his cohort at Xerox PARC labs, back in the 60s and early 70s—which is to say, it took, let us say, 10 or 15 years to see realized in a consumer product). It has, for practical purposes, taken 30 years for a true neural network architecture to see realization as a viable product. I’ll just say, to conclude, that it’s too bad, to note only one major benefit at least as Apple presented it. I mean this aside from the vaguely engaging (not sufficiently to justify replacing my perfectly fine current iPhone 7+ model, less than a year old, outmoded as its technology suddenly has become; I will just have to live with the humiliation) application of highly secure three-dimensional facial recognition to permit use of the phone. It’s really too bad, in fact, that Apple in their considerable wisdom (borne of incredibly successful and undoubted marketing acumen—certainly Mr. Kay attests to it) chose to put enormous emphasis on what I can only describe as the colossally trivial ability to animate cartoon characters with a simulacrum of basic emotive expressions, and all that anthropomorphically at best. You’d think, and I hope in a small way, that Mr. Kay would be in concurrence, if this is not precisely what he was trying to say, and would have without the interference of Mr. Merchant, the world has enough smiling, grimacing, gesticulating cartoon panda bears. I could add that, once you have an iPhone X, unless you can use it to solve some significant complex problem that has eluded very serious invesigators and researchers for years (which I fully intend to do with mine), I would suggest you put down the phone making sure it’s on its self-charging wireless Qi pad, and go play with a dog. Salutary for all aspects of the brain chemistry. But I won’t add that, because it would be snotty. Camille Paglia broke on the national public scene with the publication of her magnum opus Sexual Personae back in 1990. It was originally her weighty and quite serious doctoral thesis, at Yale University, some 20 years previously. Since its commercial release, I have had the guarded ambiguity-laden relationship with her we all like to place under the heading of “love/hate.” Ever wary of Paglia’s inevitably brash, seemingly liberal pronunciamentos, always to my ear, as well, vaguely self-congratulatory, what I brace for, always, are crypto-fascist eruptions. These days she seems to have found at least one rhetorical nesting place in which to opine regularly, that is, with the National Enquirer of the proto-progressive left, “Salon.” Indeed, she falls well into line, as she puts it, with her “perspective as a fervent supporter of the ruggedly honest and principled Bernie Sanders.” Unhappily (in the French sense), she says so even as she steps without a skosh of trepidation and embarassment away from her prior position towards Donald Trump. He was a “carnival barker.” Now, she thrusts toward a much more accommodating stance, in a paroxysm of self-revision (perhaps in fear—and I say this knowing that la bohème de l’académie springs with predatory zeal when so accused—of not having gotten on board soon enough to embrace the inexorability of The Donald’s earth-scorching march on Philadelphia this summer). It seems now, conversely to mere weeks ago, he (or should we be considering any reference or adversion with an upper case pronoun, usually reserved for kings, God, and Jesus or Mohammed, and call Him “He?”… I would prefer Trump, or His Trumpness, or Trumper, or El Trumperino) is to be viewed differently. According to a reassuring la Paglia, as she informs her public that “[his] fearless candor and brash energy feel like a great gust of fresh air, sweeping the tedious clichés and constant guilt-tripping of political correctness out to sea….Trump is his own man, with a steely ‘damn the torpedoes’ attitude.” And she does so with an equal insouciance to the appearance of a public reversal, like any seasoned pol intent on righting the meaning of truth. However, I am not here to challenge her on what was, indeed, a refreshing and validating expression of opinion by she who must be heard in the very same column in today’s Salon (I Was Wrong About Donald Trump). Though, briefly I have to admit it is inviting to point out the myriad aspects of Trump’s public persona that are signifiers of a wholly insupportable inhumane tendency—qualities the foremost diva of the academy elects to overlook in her 180-degree reassessment. Rather I am here to take what is to me a godsend of an opportunity to quote her on another curious phenomenon in this day of grotesque judgments by the establishment as to what constitutes newsworthiness. Never mind as to what constitutes worth of any sort that is substantiated by reality, and validated by any kind of rigororous epistemological scrutiny. 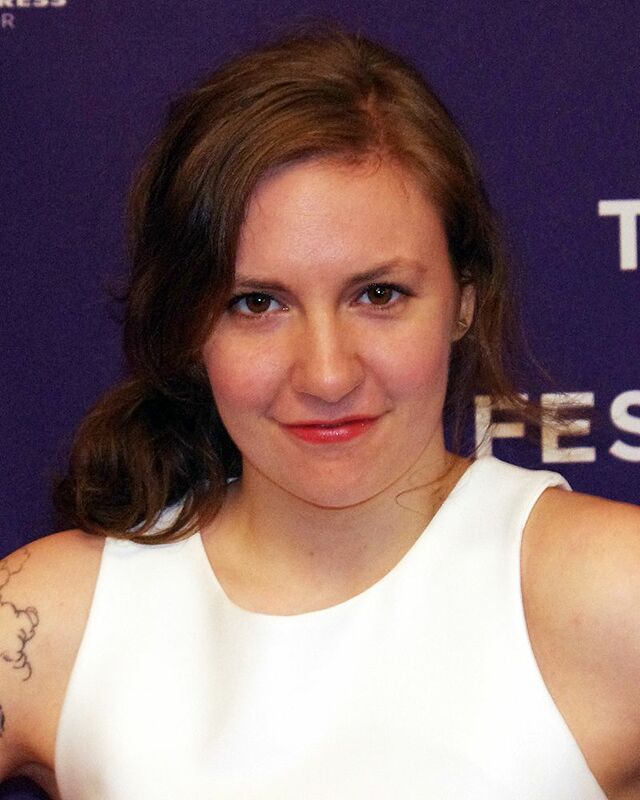 I speak of one of my personal bêtes noires, Ms. Lena Dunham. Lena Dunham belongs to the exhibitionistic Andrea Dworkin school of banner-waving neurotic masochism. The body is the enemy, a tainted lump whose limitations and afflictions the public must be forced to contemplate in grisly detail. We must also witness, like hapless medieval bystanders at a procession of flagellants, just how unappetizingly pallid Caucasian flesh can be made to be without cracking the camera lens. The torpid banality of Dunham’s utterances (reverently accorded scriptural status by the New York Times) is yet another matter. I am woman–hear me kvetch! Sometimes the old ways are best. Wednesday this week was a day I had been anticipating. November 11 was the announced date of the availability of a new Apple product, the iPad Pro, introduced in September to great fanfare (and my immediate optimistic enthusiasm) as a new generation of tablet. The tablet, especially the iPad, which is the market leader in a number of dimensions, price, popularity, performance, has been on the decline by the usual economic measures, not the least of them being growth of sales and percentage of corporate revenue for Apple. Nevertheless, the Pro seemed to augur a new stage of development for this particular species of device: a professional tool, highly mobile, that could be used not only to enable, but to facilitate creative innovation, from concept to execution for a world more and more populated by expressive and informative media that are digital, starting from the origin of an idea. To be introduced along with the significantly enlarged form and screen size of the tablet are two ancillary or collateral or auxiliary input devices: a keyboard and a stylus. The screen of the new version of iPad is more or less the same size as the screens of the smallest laptop products offered by Apple, the MacBook line of computers. The latter are still, more or less, the only growth category in the slowly withering category of personal computer devices that are not strictly mobile. All this is to say that the world at large is slowly becoming dominated by digital devices that fit in pockets, however large and capacious they may have to be to accommodate some of the larger smartphones. It was to be, and, for all I know, still is to be expected that new devices like the iPad Pro, as well as the hybrid Surface Book, which is Microsoft’s entry into what marketers like to call the “crossover” category of tablets qua notebook computer (the former ad man in me cannot overcome the impulse to recall that old joke, I think from SNL, “It’s a mouthwash! It’s a floor polish!”). It has a keyboard, but it also can be used strictly as a touchscreen device. It also has been designed (this is somewhat more true of the Apple product, but applies as well to the design ethos of the Microsoft product) to be that much more precise in its responsiveness and accuracy in the rendition of design elements: both type and graphic elements, photographic or manually drawn. 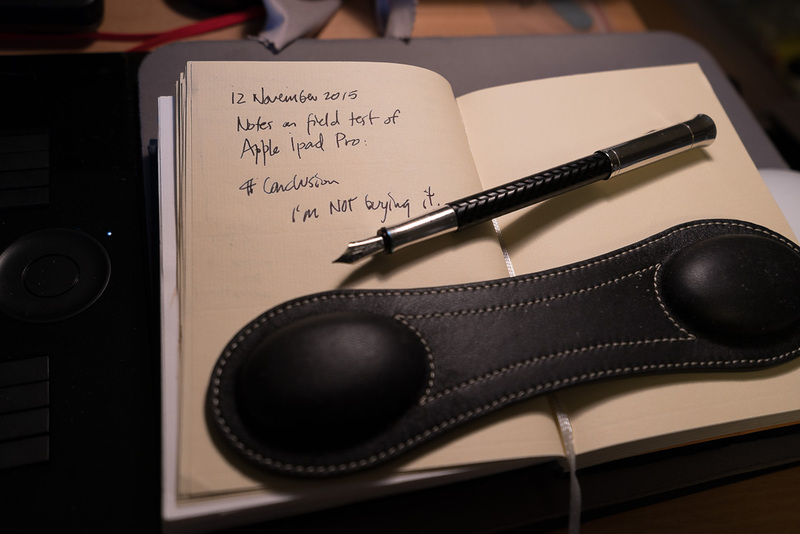 To reinforce the perception of the iPad Pro as a professional device is the Apple Pencil, the company’s first venture into a discrete digital stylus offering (the doomed Apple Newton, in the 90s, had a stylus as a necessary adjunct to using it, but it was just a stick, not a connected digital instrument). The sainted Steve Jobs famously allegedly put the kibosh on the development of any such capability in association with the iPad concept by dictating, in an off-handed brief encyclical to the world, that a fingertip was stylus enough for anyone. Nevertheless, in terms of technical specifications, it seemed to me that the Apple Pencil raised the product category of stylus to a new level of accomplishment for the engineers—or so it seemed back in September with the onstage product demo. It is responsive and significantly more precise in terms of the rendering almost immediately and visibly with the necessary synchrony of where the tip of the instrument, which is about as sharp (or dull) as a slightly dull graphite pencil or, perhaps, a Bic ballpoint pen, meets the slick glass surface of the screen. Beyond that it falls short in exactly the same way all styli on digital touchscreen instruments do. It is a unique form of recording instrument and must be learned to the expert level to exploit fully. I imagine the heuristics are similar to any new form of technology, meant to analogize an existing, especially what I’ll call a natural, form. Playing a musical instrument, or learning to perform arthroscopic surgery, or learning to perform arthroscopic surgery using a robot across the operating theater with the patient separated from the surgeon, flying by wire, operating a rover on another planet. All of it is possible, and any of these examples doubtless provides a context for creating new forms of art (in the broadest sense). In the case of the Apple Pencil, or any digital stylus, what it, the thing itself, does not do is replicate in any way, for one, the act of drawing on materials made of fibrous layers of something that at one time was growing: a tree, a reed, a young animal, flattened into a thin pliant sheet—so as to create a surface receptive to microscopically colored media prepared in a form of a sharpened stick or paint or ink, in short, material that may, at once, lubricate, suspend, and release the colorant as the instrument is dragged across the surface of the substrate. I mean of course ink, or graphite, or chalk, or paint, or dye used to make a record of one’s strokes. Whether it’s paper in its myriad forms, or parchment, canvas, or other kinds of cloth, or, alternatively, wood or metal or the stone wall of a cave, and with the laborious technology required to make these surfaces receptive to the colored material, there’s “tooth” to the surface which variously impedes and permits the progress of the recording medium onto the tactile surface. But there’s no way polished plastic molded to a point pulled across a glass surface can mimic the sensory experience of these phenomena. I’m not commenting on and surely not denigrating the genius of programmers who have found ways of digitally replicating the act, and the result of the action, of nearly every technique invented in the entire history of homo pictor, whether it’s spray painting, pencil drawing or creating a cyanotype photographic image. However, it’s the result that is replicated, or at worst mimicked, and not the techniques or means to create the artifact with the appearance of a specimen prepared in the canonical manner. I could lapse into a very long digression about the increasingly resonant meanings and applicability of Walter Benjamin’s essay, “The Work of Art in the Age of its Technological Reproducibility,” whose increasing relevance to the existential aspects of daily life as time progresses in Western countries has a crescendo-like impact on my sensibilities at least. But I think I’ll stick with what I set out to say, which is to critique the new Apple product, and to articulate why I decided not to buy it. The latter phrase will alert only people who know me personally and fairly well, know me for the inveterate and, I’m sure, sometimes seemingly unquestioning, wholly credulous, perpetually positive fan boy that my money and its free flow into the coffers of Apple Inc. would have seemed to attest in the past. However, the last three product introductions, for me, have proven a bust: the MacBook laptop (in three simulacrums of other kinds of metal than the aluminum of which it is crafted, including two tones of gold), the Apple Watch, including the version that actually is made of gold and priced starting at north of 17 thousand dollars, and now the iPad Pro. My first criterion is whether conceptually, especially as depicted in Apple’s devilishly alluring product videos, but, more importantly, once I can put the object in my hands, it instills that acquisitive impulse, usually fashioned in the compelling form of a felt need, as opposed to the more likely, and more accurate, covetous want. Without that impulse, I can’t persuade myself, even with considerable powers of logic, sometimes used self-reflexively, but still sophistically, that I should part company with significant amounts of cash. In the end, what impressed me, after a full half hour at the Apple Store, unmolested and uninterrupted, with the iPad Pro, the Apple Pencil, and the so-called Smart Keyboard, was that these were products perhaps as expressive as any, if not even more so, of the Apple genius for slick design. But our household is filled with devices, none at the moment quite as new as introduced this week, but still representative of the same corporate ethos: tablets and phones, and computers, and music players, and dozens of accessories, converters, adapters and cables—and there are only two of us. And the iPad Pro is simply a very big iPad, and, despite Apple’s attempt to turn its size into a virtue, and for some, doubtless, a very large screen is exactly that, to me it’s clunky, and it has passed over some undefined boundary in my mind for what is an acceptable mass to carry around for a purportedly portable device (I hate the term “mobile,” and even more so as a noun; a wheelchair also is mobile—at the very least it must be conceded that it makes the person borne in it mobile when they would otherwise not be). The Apple Pencil is now the premier exemplar of the category of digital stylus. Indeed, if Apple had lost its capability to trump all previous efforts by all other parties to dominate a category of digital device with the design and relentless rigor and simple beauty of it, I’d short my stock. The problem for me is that it is not that superior to the half dozen or so other styluses I have acquired, each of them at the time of acquisition the “state of the art” one way or another (and developed in the context of Apple purportedly considering category to be irrelevant pace Steve Jobs, who thought we should all be satisfied with the digital styli we were born with at the ends of the palms of our hands). I wish I still had all the money invested in those styli. They do work, and some not very much worse than the Apple Pencil, as Apple has no complete monopoly on clever engineers. No I’ll skip it, and the keyboard, and the stylus, and I’ll reserve those discretionary funds, which I also remind myself I am very fortunate to have to enhance my resources for being creative when the mood strikes. There’s a lens for one of my cameras that I’m looking at, and am kind of fond of.